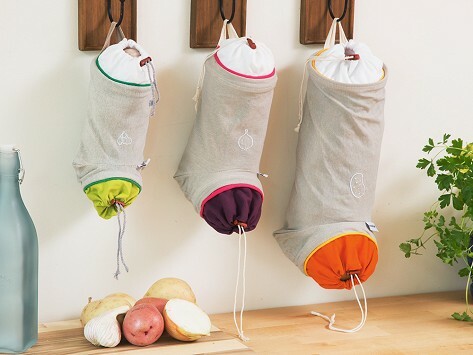 Hang potatoes, onions and more in this set of reusable vegetable storage bags that keeps the pantry tidier and prolongs the shelf life of root veggies. The light-blocking cotton/linen canvas bags are durable and washable, and have a first-in-first-out design that is secured with drawstrings. This trio of bags are sized to suit vegetables ranging from garlic up to potatoes, and all the onions and shallots in between. Have them hanging in my pantry. They are so unique and perfect for storing my vegs.